You're playing multiple-deck blackjack with the option of soft doubling available. You are dealt an Ace and a five for a total that you can use as either 6 or 16. You're going to play this hand against the dealer's five. The choice here is between hitting and doubling down. Which one of them is the more preferable option? 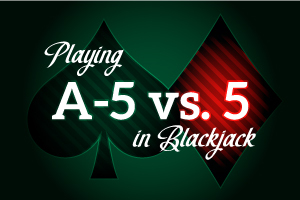 The five is the second worst card the dealer can have as his upcard (only six is worse). With the five showing, the house will bust 43% of the time and will achieve 19 or better on just 33% of occasions. You should relax. You're in a pretty nice position here. You are going to win 6% more than you lose on the average (51-45) when you double down. That means a 12% gain per hundred hands. Hitting the hand will yield you positive results as well, with about 6.5 more winning hands per hundred. What this means - when the double wager is factored in - is that when you double in this situation you will win 1.8 times more units in the long run than if you hit. Gains like this should serve as good illustrations for the argument that the soft doubling option is a very important factor is getting a favorable blackjack game. In point of fact, it is worth at least .11% to the player and as much as .2% if the player has the rule at his disposal and can use it correctly.